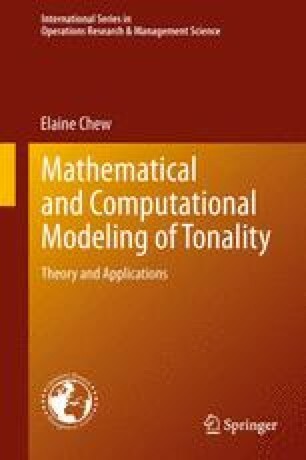 This chapter describes an \(O(n)\) algorithm for segmenting music automatically by pitch context using the Spiral Array, a mathematical model for tonality, and applies it to the segmentation of post-tonal music, namely, Olivier Messiaen’s Regards IV and XVI from his Vingt Regards sur l’Enfant Jésus. Using the idea of the center of effect(CE), a summary point in the interior of the Spiral Array, segmentation boundaries map to peaks in the distances between the CEs of adjacent segments of music. The best-case computed boundaries are, on average, within 0.94 % (for Regard IV) and 0.11 % (for Regard XVI) of their targets. This chapter grew out of a talk given at the MaMuX seminar organized by Moreno Andreatta on March 21–22, 2004, at IRCAM, whereby all participants were encouraged to concentrate on a few selected pieces from Messiaen’s Vingt Regards. I thank Moreno for sparking my interest in analyzing selections from Messiaen’s Vingt Regards, and the attendees of the MaMuX seminar for their valuable feedback at that initial analysis of Regard IV. I also thank Gérard Assayag for his encouragement to submit the paper to the First International Conference on Sound and Music Computing, and the opportunity to expand on the paper. The reviewers’ detailed comments that have helped shape the current version of the paper are much appreciated. This material is based upon work supported by the National Science Foundation under Grant No. 0347988. The work made use of the Integrated Media Systems Center Shared Facilities supported by the National Science Foundation under Cooperative Agreement No. EEC-9529152. Any opinions, findings, conclusions, or recommendations expressed in this material are those of the authors, and do not necessarily reflect the views of the National Science Foundation.